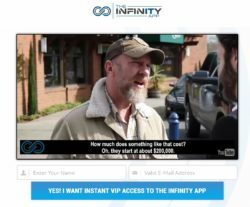 This review proves that The Infinity App (The Unlimited System) is a scam that will lose your money. It is presented by Mark Stevenson. Stevenson claims to be a former NASA engineer. 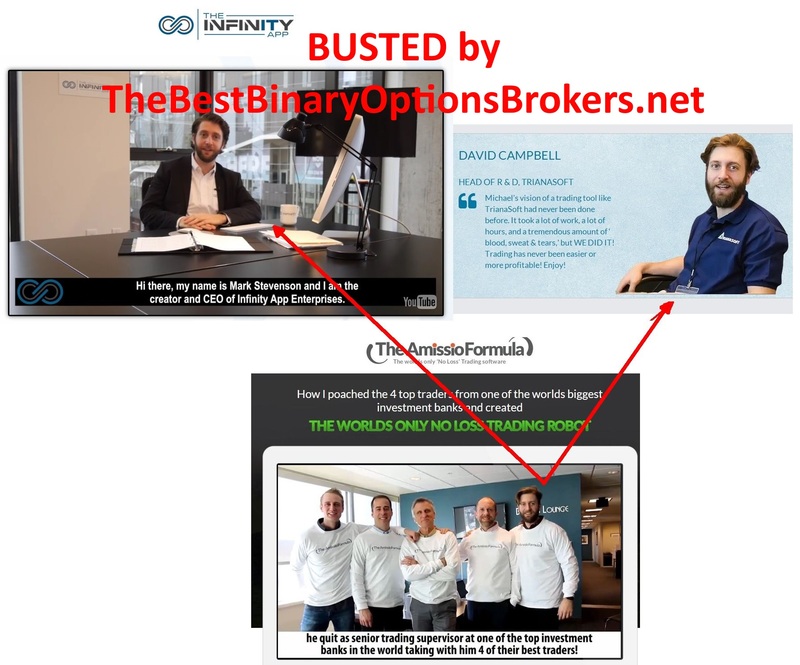 He says that he created a binary options trading software called The Infinity App. It allegedly can make you thousands of dollars per day. And because Stevenson is searching for 35 beta testers for his platform, you can get The Infinity App for free and become rich for free. Really? The truth of course is that Stevenson is a scam artist and The Infinity App is a scam that won’t make you any money. In fact, it will take your money and lose it in trading. Stevenson is a fictitious character played by an actor. There is no NASA engineer of this name who trades binary options. The actor who plays Stevenson’s role is a well-known scammer who played also in the Trianasoft and Amissio Formula scams. Back then he used the name David Campbell. The presence of this guy alone guarantees that The Infinity App is a scam. In the Infinity App video Stevenson shows some alleged trading results of his system. But they are all fake. Look at the picture, on the left you will see that the account statement is totally fake. The dates of trades are from 2017, but expiries show 2016. So the statement has been clearly edited. On the right you will see a screenshot from the video showing that scammers were in the editing mode when showing you their sreens. All the people you can see in the Unlimited System video are paid actors, all the testimonials are fake. You just cannot open a binary options trading account, deposit and withdraw, all within the same day. You have to go through identity verification, so it takes more time. And last but not least, the software offered by Stevenson is a well-known app made by scammers. 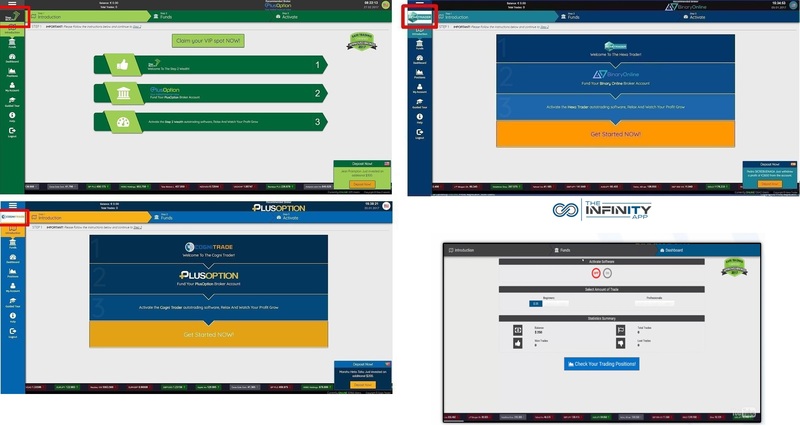 Look at the picture to see examples of other scams using this same app, like Step2Wealth, Hexa Trader or Cognitrader. We are getting a lot of feedback about the software used by The Infinity App and it is negative, because this program is losing money! So how does The Infinity App really work? After registering they will force you to deposit money with a broker of their choice. It is because they are getting paid by this broker for referring new depositors. This is how they earn money. They won’t let you use the software until you deposit. But if you do it, The Infinity App will lose your deposit in trading, because it is a piece of crap. The Infinity App is a scam made to lose your money. Stay away from it! If you are interested in making money with binary options, open a free demo account to see how it really works. On the demo you should learn to trade profitably before going live and trading with real money. I really dont know whom to trust to. It seems to me that almost all these days are scams. Hi, unfortunately yes, the binary options industry is dominated by scams. 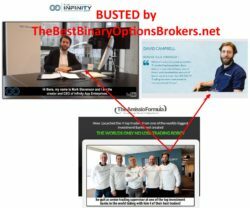 i was a victim by this infinity app scam with their broker the binarytilt. is there a possibility that i can get back my hard earned money from them? I’m afraid that it will be difficult. You can see with authorities (national financial regulator, police) if they can help you. how embarrassing if you fell for this crap so many vulnerable people out there. If I saw this guy in the street I would give him a baseball bat to the face. This type of scam is something my father or uncle would be taken in by. The guys behind this scam will all go to hell. no moral compass. By is video and his characters in the video shows that is totally scams about it. The one who is he met rovert he is also a part of this video and also a part of this fake scam.